Hydro-Québec's research institute in Varennes is home to the company's largest transformer. It weighs 507 tonnes and holds 212,000 litres of mineral oil, an insulating material. 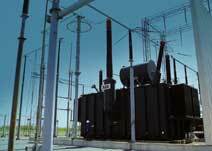 Substations have many functions for controlling power flows. For example, they play a key role in dividing long lines into smaller sections. This helps to minimize any disruption to the continuity of service when a section is not functional, during a fault or maintenance period. current transformer and power transformer); protective equipment such as circuit breakers, for interrupting a line’s current, or surge arresters, which protect transformers from a voltage spike caused by lightning; control devices, such as disconnect switches and busbars, which are used to switch energy from one line to another almost instantaneously (when sections are out-of-service, for example). Other instruments, such as reactors, capacitors and compensators, are also used to control the voltage in substations. Most of the substations are automated and remotely controlled; only the most important ones have technical personnel permanently on-site. Maintenance of the other substations is performed by mobile teams.